In this respect, Employees Provident Fund’s Belanjawanku 2019 for Klang Valley, which was launched by Finance Minister Lim Guan Eng on March 4, is built on the basis of educating the public and ensuring improved financial literacy among Malaysians. Belanjawanku provides detailed personal budget information for individuals and families to know the requirements of their monthly expenses in order for them to make wiser financial decisions. The items and their costs included in Belanjawanku are the minimum that a person or family needs in order to attain a reasonable and acceptable standard of living. Belanjawanku is a project proposed by the EPF as part of its financial literacy programme and the detailed study was carried out by a team of researchers at Universiti Malaya’s Social Wellbeing Research Centre (SWRC). The research involved identifying the expenses of working adults under 40 years old and of senior citizens through a questionnaire survey, as well as conducting focus group discussions with researchers from local universities, representatives from the EPF, Credit Counselling and Debt Management Agency (AKPK), Economic Planning Unit, the National Wage Council, non-governmental organisations, Bank Negara Malaysia and experts from industries, which include financial institutions, financial planners, nutritionists and reference persons of specific households living in Klang Valley. People are generally healthy and have access to universal healthcare and primary and secondary education. Additionally, the study included price surveys carried out between July 2017 and July 2018. Prices for food and groceries for home cooking was obtained from wet markets and popular supermarkets around Kuala Lumpur and Selangor. While cost for dining out was obtained from the average price of food at food courts and mid-range restaurants selling mixed rice (nasi campur) and noodles, food prices at mamak and kopitiam outlets around Kuala Lumpur, Petaling Jaya, Subang Jaya, Shah Alam, Puchong, Bangi, Kajang, Ampang, Ulu Klang and Mutiara Damansara. The product choices for all categories of items were taken mainly from 15 popular brands. In calculating the acceptable housing expenditure, comparisons were made between the monthly costs of room/house rental and housing mortgages. Based on this, for rental rates, the average flat, house and room rental for several districts in Klang Valley was obtained from www.mudah.my and www.ibilik.com, as well as the Research Structure Plan for Selangor 2035 Report, published by the state government of Selangor, 2010. Money is an essential component of the economy and Belanjawanku serves as a practical reference and foundation for money management. 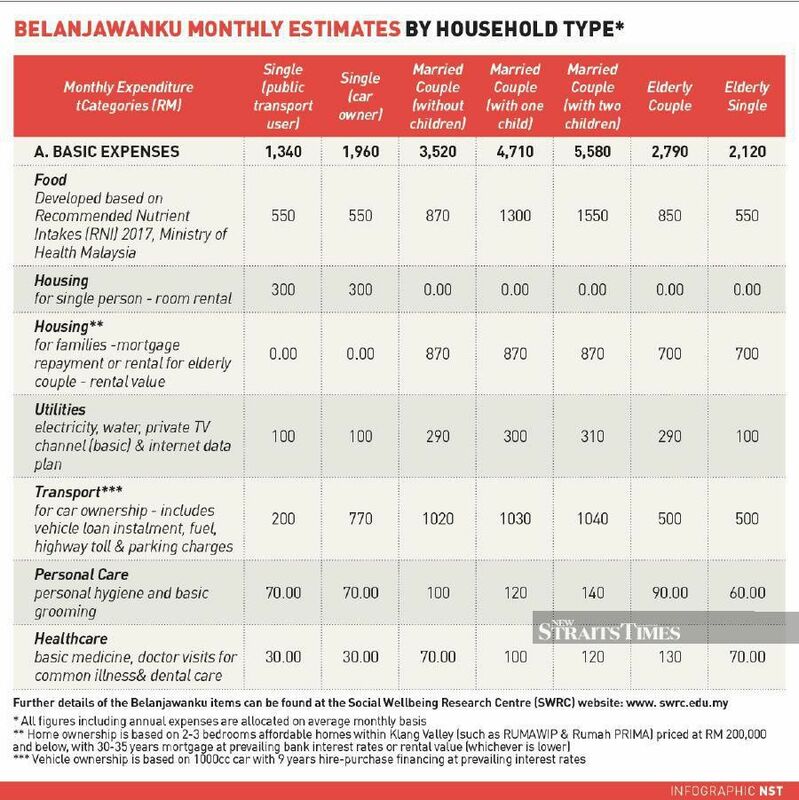 As it is, since Belanjawanku was launched, there has already been numerous healthy, and sometimes, heated debates about the numbers that have been proposed in Belanjawanku as a guide for monthly living expenses. This is because people of varying backgrounds and income levels have their own interpretations of the required monthly expenditures. Bearing in mind that Belanjawanku is not a prescription or a “standard” that one has to follow. It is a guide for basic expenditure and for those who can afford to spend more, there is nothing stopping them as long as their lifestyle can fit into their income. What the active discussions indicate is that people are indeed aware of and keen to share ideas to improve the general level of financial literacy skills and improve the management of their finances. Datuk Dr. Norma Mansor , who is president of the Malaysian Economic Association (MEA), is Emeritus Professor and Director, Social Wellbeing Research Centre, Faculty of Economics and Administration, Universiti Malaya.